Where would we be without literature? Books provide an escape into a whole other world, and provide a platform for all kinds of information, both anchored in real life and the imagination. Being a book lover is something to be proud of, and the best way to show off your love of literature is to immortalize it through tattoos. Your opportunities are endless in terms of tattoo design ideas, from specific novels and their symbolism, to going literal with books themselves. We’ve put together some ideas to help you come up with the best book tattoo idea for you. 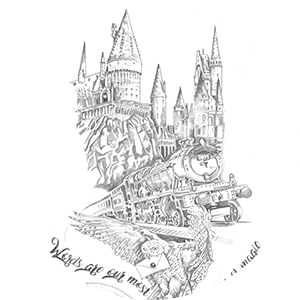 Harry Potter Tattoo Ideas – Harry Potter is one of the world’s top selling book series, and one of the most popular books to inspire fan tattoos. There are a number of symbols in the book can that can be used for great Harry Potter tattoo ideas, including: symbols for Ravenclaw, Gryffindor, Hufflepuff and Slytherin Houses, the Deathly Hallows, wands, Harry’s lightning bolt scar, dragons, the Triwizard Tournament trophy, the Goblet of Fire, hippogriffs, Nimbus 2000, a golden snitch, and butterbeer. Whatever your favorite part of the book series is, odds are there’s a symbol that can be used to represent that in a Harry Potter tattoo. Stephen King Tattoo Ideas – The King of horror has written almost a hundred books, not to mention his short story books with 20 or more stories in them, so there’s a ton to choose from if you’re looking for a tribute tattoo to his work. Some of the top Stephen King tattoo ideas include things like: the loser turns lover cast signature from IT, Pennywise’s face, the ominous red balloons from IT, quotes from The Dark Tower, REDRUM, symbols from the The Dark Tower series, quotes from The Shining, the carpet pattern from the Overlook Hotel, room number 237, Jack Torrance axe, vampire’s face from Salem’s Lot, and Cujo’s portrait. You can easily make your own unique Stephen King tattoo by using your favorite moment from any one of his books. Alice’s Adventures in Wonderland Tattoos – Written in 1865 by Lewis Carroll this classic novel on which Disney’s Alice in Wonderland is based. The imagery in this story is largely whimsical, so it makes for awesome tattoo design ideas. Any number of images can be used from the book to create a vividly stunning tattoo, like: the Mad Hatter’s hat, dishes from the Tea Party, the Cheshire cat and his smile, the Queen of Hearts, the looking glass, the white rabbit, and alice herself. Anything from this book has potential to create visually appealing works of body art. A Clockwork Orange Tattoos – A Clockwork Orange is a dystopian 1962 classic novel adapted into an equally cult classic film directed by Stanley Kubrick in 1971. The book and movie are full of disturbing imagery and odd symbols, all of which can make great tattoo designs for fans of this story. Symbols that can be representative of the story include such things as: Alex’ bowler hat, Alex’s portrait, a triangle, an eye with long bottom lashes, a glass of milk, an abstract design incorporating black, white and orange, an orange, a gang of guys, quotes from the book, a gear, and a cane. The ultraviolent book has some unique imagery associated with it, so fans of the book are sure to recognize where your tattoo inspiration has come from. The Little Prince Tattoos – Le Petit Prince is a 1943 French novella about an adult man meeting his inner child. This book resonates with a lot of people, which is why it has remained popular for last several decades, even inspiring an English film adaptation in 2015. One of the most famous images from the book, and one that is popularly used for tattoo design, is that of a boy and a fox sitting side by side on the moon looking out into space. Some other iconic symbols from the book are designs like: a baobab tree, a baobab tree cover by a glass dome, stars, a fox, an elephant in a boa constrictor, a ringed planet, stars, a boy on an flowery planet with space in the background, a boy with a long trailing scarf, a cratered moon, and a boy holding onto a flock of birds tied with strings. This melancholy book contains some powerful images which can be used for exceptional tattoo design ideas. Reading Tattoo Ideas – For lovers of reading, you don’t necessarily have to get a tattoo about a specific book to illustrate your literary enjoyment, especially if you have more than one favorite. You can showcase your love of books by getting tattoos that symbolize reading and books themselves, such as: a stack of books, a stack of books with titles of some of your top picks on the spines, one book open with a page turning, an open book with birds or words flying out, a book and a feather quill, or, simply, a single novel. Literary Quote Tattoos – Famous and notable quotes from well known books can be used for beautiful and meaningful tattoo designs done in scriptwork style. You could take a line that resonates with you from your favorite book, an entire block of text that you feel is meaningful to your life, or a single word from a novel that you’ve read and enjoyed. There are hundreds of thousands of quotes that could make potential book tattoo ideas, the first step is to choose a book to take your inspiration from. There’s always a way to show your love of books through tattoos, you just need to come up with a tattoo idea that suits the novel. Whether you want a tattoo that depicts your interest in reading, or one that’s dedicated to your favorite work of literature, there are endless options to what kinds of designs you can get – it just takes a little imagination and bit of inspiration. Do you have a tattoo for your favorite book? Let us know in the comments!